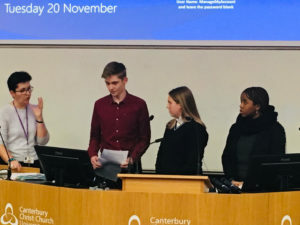 EKST Student Voice Ambassadors were invited to speak at an event at Canterbury Christ Church University on Tuesday 20th November to mark Universal Children’s Day. 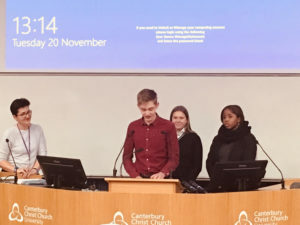 Imogen and Matthew, the co-Chairs of the Student Voice, together with Marissa (all in Year 12), spoke about what it means to be a child in the 21st century in a panel chaired by EKST Champion, Kerry Jordan-Daus. They described the stress of coping with the constant ‘fear of missing out’ that social media has brought. Living in a global society with a mobile workforce means that the pressure of gaining good exam results to compete for university places is more stringent than ever. And mental well-being is what suffers as a result. Interestingly, the students agreed that compared to previous generations they feel they have been spoiled to a certain extent; the modern world has brought an expectation that you can have anything you want right now and modern parenting molly-coddles young people these days . This has led to their generation being perhaps less resilient and therefore less able to handle the pressures mentioned before. 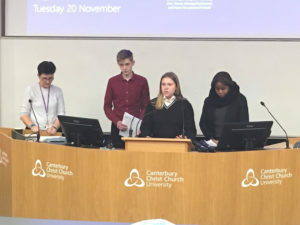 The students would like to be able to vote at an earlier age, citing the Brexit referendum as an example of older voters swaying a decision which will affect younger people more. They also feel that it is their responsibility to do something about the environment and to try to live more sustainably.